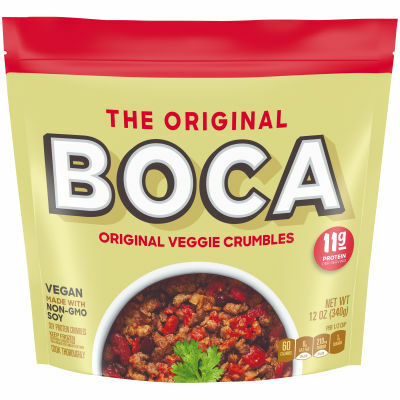 A seamless substitute for ground beef, these BOCA Veggie Ground Crumbles are great for all your meatless tacos, burritos, and chilies. They contain 60 calories per serving and 11 grams of protein A Delicious and Vegan Alternative - these protein crumbles come in a convenient resealable package that is ideal for storing in the freezer, so you can easily keep some on hand for when a craving strikes. Serving size 1/2 cup (57g).